The first Nintendo Switch entry in the popular fighting game series. 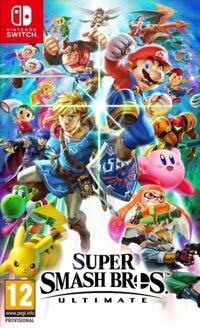 Similarly to the previous entries in the franchise, in Super Smash Bros the players assume the role of characters known from other Nintendo games and they fight each other on multi-level arenas. Super Smash Bros. Ultimate is another entry in the popular series of fighting games. During the game, the players assume control of characters known from games published by Nintendo and they fight each other on multi-leveled arenas. What distinguishes the game from other fighting games is the fact that during the game, the gameplay mechanics frequently changes, borrowing mechanics from other genres (mostly from platform games). In addition to characters from previous entries in the series (including Mario Brothers, Donkey kong, Samus Aran, Link, Solid Snake, Bayonetta, Cloud), the game features some newcomers, like Inklings from Splatoon series. Game score 7.1 / 10 calculated out of 89 players' votes. Expectations before the premiere: 9.0 / 10 calculated out of 33 players' votes.